Construction Resources, Inc. is pleased to announce its annual spring clearance sale on Friday, May 11 and Saturday, May 12 from 9 a.m. to 6 p.m. at its showroom and slab gallery located at 224 Rio Circle, Decatur, Ga. 30030. This is the perfect opportunity for homebuyers, remodelers and designers to purchase kitchen and bath materials at deeply discounted prices. 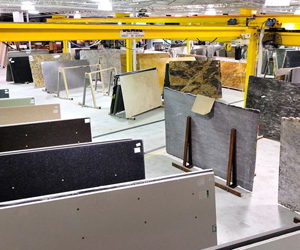 The Kitchen and Bath Showroom and Indoor Slab Gallery at Construction Resources is a one-stop-shop for premium countertops and specialty products for homes and commercial spaces. Artisan Stone Collection, Kohler, Saratoga Soapstone, Heritage Wood, Caesarstone, Silestone, Corian, Zodiaq, Vetrazzo, Shaw, HiMacs, Viatera, Dal Tile, Artisan Sinks, Coastal, Closet Maid, Atlanta Marble Mfg., and Mohawk. The sale is open to the public and will be held rain or shine. All quartz remnant inventory, $10 per square foot (material only). Template, Fabrication, and Install Labor offered at one low price. 15% off Special Colors in Atlanta Kitchen extensive Slab Gallery. First 10 qualified buyers of 40 SF or more of countertop material receive free sink and faucet. There will be raffle prizes both days including Construction Resources Gift Certificates, Cambria Gift Certificates and Cambria Cheese Boards, so make sure to register to win. A shuttle will run guests from the indoor slab gallery, slab yard, and other buildings on Construction Resources’ 13 acre facility, which feature more than 3,000 granite and quartz slabs with hundreds of colors, styles and sizes to choose from. More than 30 experienced Construction Resources Project Managers will be on site to assist with your selection process. Buyers interested in Cambria countertops can take advantage of the Cambria financing option, which is interest-free for up to one year with no payments. Cambria will finance up to $45,000 for a project that includes their quartz countertops. Talk to an Atlanta Kitchen representative for more information. Construction Resources accepts American Express, MasterCard, Visa, and Discover. Finance packages are available. All Clearance Sales are FINAL and must be picked up or installed within 30 days. To achieve Clearance Sale savings, all purchases must be paid 100% at time of purchase and signed contract.